The official introduction of the euro in Lithuania: does it really make no difference? On 1 January 2015, Lithuania adopted the euro officially, becoming the 19th member of the euro zone. The adoption was in reality formal, as the euro was already (very) present in Lithuania. For example at the end of 2014, over 75% of loans to Lithuanian businesses and households were denominated in euros, as were 25% of bank deposits. The use of the euro alongside Lithuania’s national currency, as a currency for loans, a means of savings and for invoicing, is neither an anomaly nor simply an anecdote: this practice concerns or concerned a number of countries in the former communist bloc. “Euroization”  is the result of economic and political events that, at one time or another in these countries’ histories, have led them to use the euro in addition to their own currency. So given this context, will the official introduction of the euro in Lithuania really not change anything? Not exactly. Lithuania will see some changes, admittedly minor, as will the decision-making bodies of the ECB. If we exclude the principalities, islands and States (Andorra, San Marino, the Vatican, etc.) that have negotiated the adoption of the euro with the European authorities but without joining the European Union together with the countries that have adopted the euro unilaterally (Kosovo and Montenegro), there is in addition a whole set of countries that use the euro alongside their own currency. These countries are mostly from Central and Eastern Europe, the Balkans or the Commonwealth of Independent States (CIS). 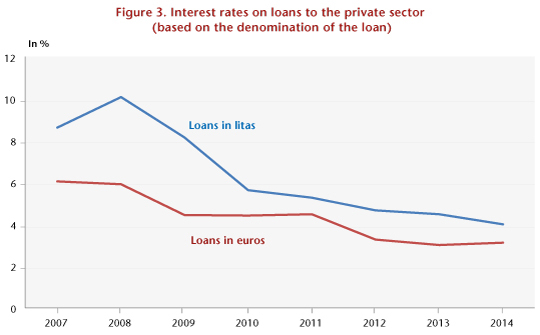 For example, in 2009, before Estonia and Latvia officially joined the euro zone (in 2011 and 2013, respectively), lending by private agents in the three Baltic states was mainly denominated in the euro, reaching a level of almost 90% in Latvia (Figure 1). Countries such as Croatia, Romania, Bulgaria, Serbia and Macedonia were not far behind, with over 50% of their loans denominated in euros. 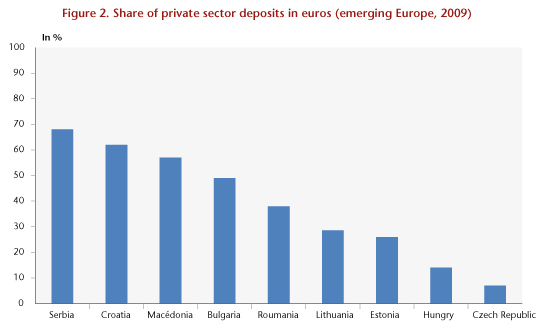 The figures for deposits in euros are somewhat less striking (Figure 2), but still raise questions as to the attraction that the euro exerted in some countries as a payment or reserve currency or for precautionary savings. – For loans in euros, the ex ante existence of bank deposits in euros, which is itself linked to multiple factors (e.g. the credibility of the monetary authorities, a strong presence of multinationals, revenue from migration coming from countries in the euro zone) . These factors have been present to a greater or lesser extent in the different countries. In Lithuania, the existence of a Currency Board  vis-à-vis the euro since 2002 has generally contributed to the economy’s “euroization”. This system of fixed exchange rates has enjoyed great credibility, prompting the country’s businesses and consumers to borrow in euros, particularly since these benefited from very low interest rates (Figure 3). The presence of multinational companies in a number of sectors strengthened the use of the euro as a benchmark currency for different functions (billing, deposits and savings). The importance to Lithuania of banks from the euro zone should nevertheless not be overestimated: the three largest banks operating in Lithuania are from Sweden and Norway. The risk of loans in euros thus involves, beyond the risk associated with the value of the Lithuanian lita, a risk associated with the value of a third currency. … This risk will obviously not disappear with Lithuania’s formal adoption of the euro. What changed on 1 January 2015? (1) The euro now circulates in Lithuania in the form of notes and coins, whereas previously it existed primarily in the form of bank money (bank deposits and euro-denominated loans); the euro is the legal tender and will be used for all transactions; and the lita will disappear after dual circulation for a fortnight. (2) Changes to the price labels for goods will result in additional inflation, due to more frequent rounding off upwards rather than downwards. However, this phenomenon, which has been seen in all countries during the transition (official) to the euro, should have only a minor impact. Experience shows that in general perceived inflation is higher than actual inflation. (3) Lithuania is adhering de facto to the banking union, which can provide benefits in the financial sector (e.g. opportunities for additional collaboration in a common monetary and banking space, existence of an orderly resolution mechanism in case a bank runs into difficulty). (4) The Governor of Lithuania’s Central Bank is now a member of the ECB Governing Council and therefore participates in decision-making on euro zone monetary policy, whereas previously, under its Currency Board system, Lithuania’s Central Bank had no choice but to “follow” the decisions taken by the ECB in order to maintain parity with the euro. It could be argued that in any case Lithuania will not carry much weight in the ECB’s choice of monetary policy due to the size of its economy. Note, however, that Lithuania’s entry into the euro zone is bringing changes to the way decisions are made by the ECB Governing Council. The principle of “one country, one vote” that prevailed until now is being abandoned in accordance with the Treaties, due to the entry of a 19th member into the euro zone. Henceforth, the five “major” countries in the euro zone (defined by the weight of their GDP and their financial system) havenow four voting rights, while the other fourteen countries have eleven votes. The vote in each group is established according to a rotation principle, which displeases the Germans, but not just them. In practice, however, it is not certain that this change in the voting system will affect many decisions. For example, while the governor of Germany’s central bank now has only 80% of its voting right, it still has 100% of its right to speak… Will not voting one month out of five really mean that it loses its power of persuasion? On 1 January 2015, the official adoption of the euro by Lithuania was thus not at all amount to a Big Bang. However, it is very symbolic for Lithuania, further demonstrating how much it is anchored in both Europe and the euro zone. This shows once again that despite all the turmoil the zone has experienced, it still has its supporters. The most striking result of Lithuania’s accession to the euro zone is probably the change in the ECB’s system of voting rights: here too the symbolic meaning is heavy, as it sounds the death knell of the principle, “one country, one vote”. Sandrine Levasseur (2004), Why not euroization ? Revue de l’OFCE, Special Issue “The New European Union Enlargement”, April 2004. Silvia Merler (2014), Lithuania changes the ECB’s voting system, Blog of Bruegel, 25 July 2014. Strictly speaking, euroization refers to the adoption of the euro as legal tender by a country without its being given permission by the issuing institution (i.e. the European Central Bank) or the decision-making authorities (i.e. the heads of State of the European Union member countries). Euroization is then said to be unilateral. It differs from the phenomenon discussed here, where the euro is used in conjunction with the national currency, but only the national currency constitutes legal tender. A currency board involves a system of fixed exchange rates in which the central bank simply converts foreign exchange inflows and outflows into the local currency at the pre-defined parity. A central bank that adopts this system gives up the tool of autonomous monetary policy: its role is reduced to that of a “cashier”.